Hi guys! As you well know I am not terribly organized in any aspect of my life, so when I woke up this morning and realized I didn't have any Fourth of July themed post ready to go today it really came as no surprise. Since I don't have any cards scanned with American Flag themed designs or USA baseball relics or political themes, I decided to fall back on alliteration. Yep, you're getting ponies today. A week ago I was in a pretty big artistic rut. Couldn't draw anything to save my life. Hadn't painted in weeks. So I picked up a pencil and went on a full blown Fluttershy frenzy. It seems to have helped. I can draw now, I'm just too lazy. 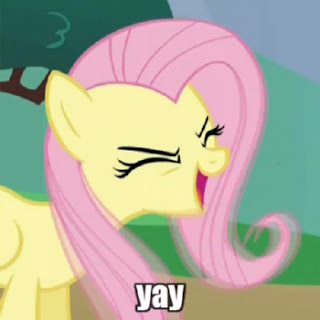 I wonder if Fluttershy has a brand of coffee. Here's the results from that evening of fluttering. 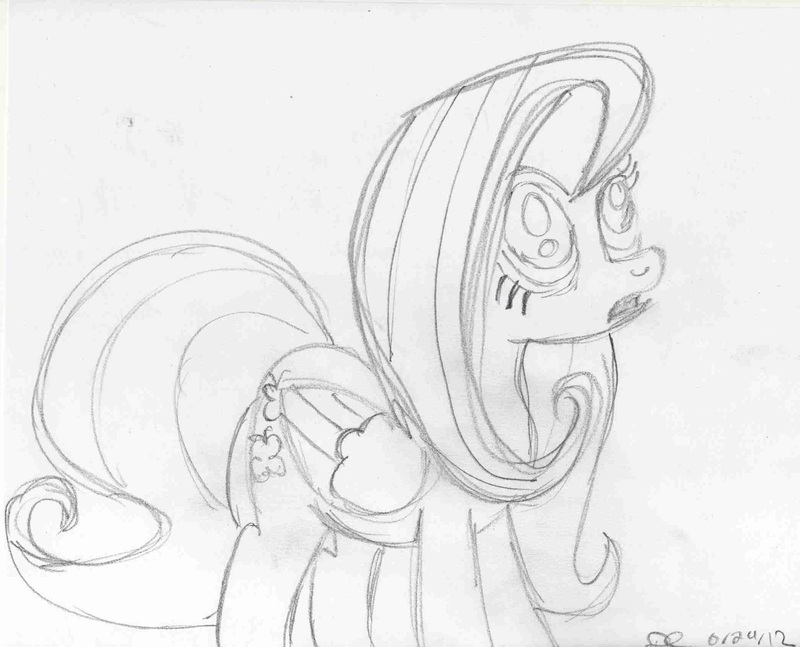 Here's a sketchy Fluttershy looking startled that I would post something so stupid on a holiday. No one reads blogs on holidays! Besides, the unofficial title of the blog is "I'd Rather Draw Ponies". Y'all knew the risks when you clicked. 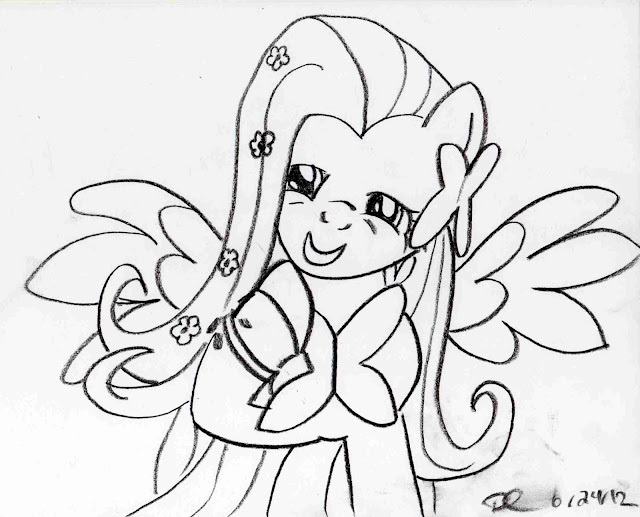 Here's a charcoal drawing of a drunk Fluttershy during her senior prom. 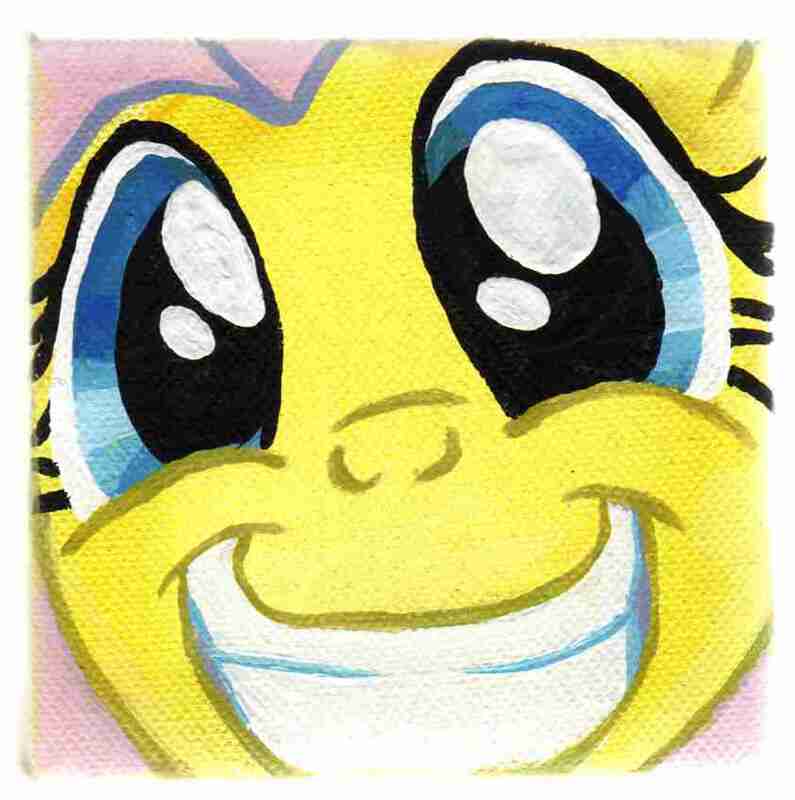 As you can see from all the smudges, Flutters wasn't the only one drunk. This one started out as a regular pencil drawing, then I went MAD and broke out the colored pencils. 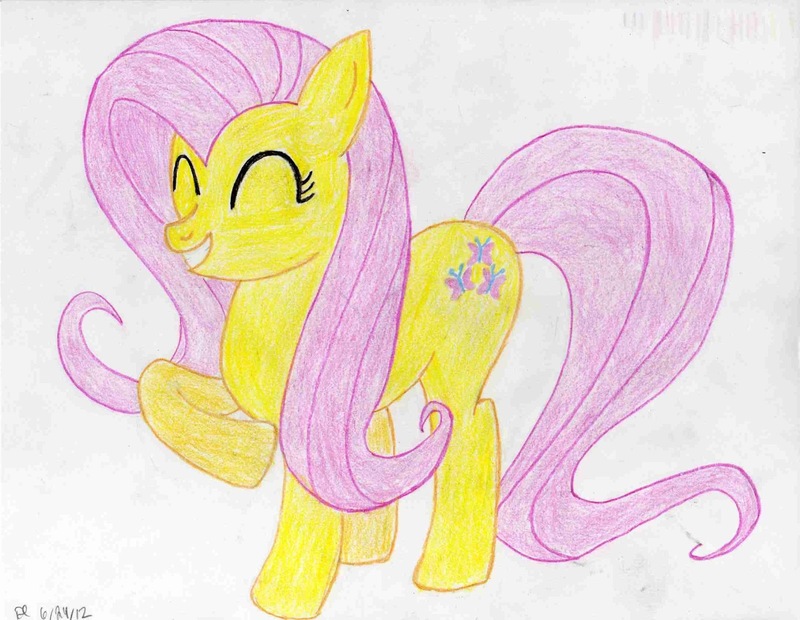 I have determined that I like colored pencils only for small sketch card drawings and coloring in all that yellow and pink is a pain in the flank. 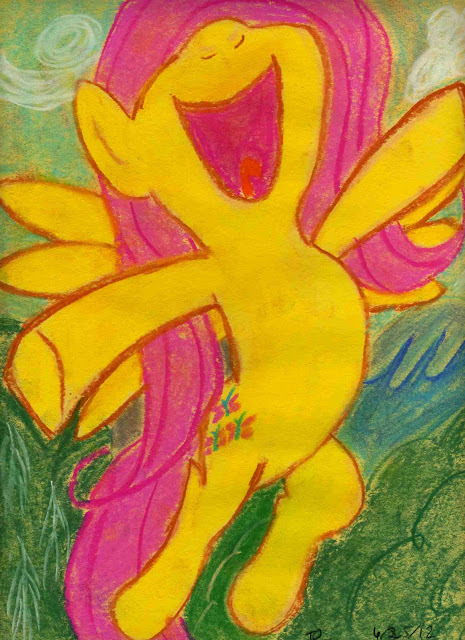 Fluttershy seems pleased with the results at least. Pastels are a pretty perfect medium for ponies. They're sloppy as hell and fun to work with too. This one came out better than expected and reminds me of Matisse for some reason. That sound you hear is Matisse's estate firing up the lawyers. Finishing up with an actual painting. Paintings's don't scan worth crap on my scanner for some reason. The pink gets all washed out. Hell of a thing to happen to a Pinkie Pie fan. I'd take a picture but you saw the quality of my camera yesterday. I got a package of useless 3" x 3" canvases in a painting set I bought on clearance simply because the paint inside the set was cheaper than buying it individually. I finally figured out something to do with those canvases. There is a non-zero probability that this will be come my avatar on some social media site sometime in the future. Well, there's all my artsy fartsy ponies. Y'all have a happy Fourth! Be sure to celebrate loudly! 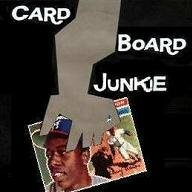 Only 11 days till the cards are out. and did you see last night's game? Chipper was awesome. Thought about you the other day. When we got here to our hotel there was a Brony convention going on.